Danilo Reis, BA History of Art with Curating student, looks back at his five weeks as one of Birkbeck’s first recipients of the British Council’s Venice Fellowships. The five weeks that I spent in Venice as a recipient of the British Council’s Venice Fellowship programme were truly life-changing. The fellowship, offered in partnership with Birkbeck, is an amazing platform for academic, social, and professional development. The opportunity to work at the prestigious Venice Biennale, while also conducting my own research allowed me to gain a valuable understanding of both the unique city of Venice and the Biennale. From the very beginning, Birkbeck and the British Council offered me a lot of professional support. Birkbeck helped me with the preparation and planning of my research project, while the British Council offered training sessions in London and put Fellows in contact with renowned institutions in Venice, such as The Peggy Guggenheim Collection, which ran study trips and tours, the European Cultural Academy, which offered professional advice on our research projects, and the We Are Here Venice project, a really interesting initiative engaged with the socio-cultural preservation of Venice. I really enjoyed working with all of these institutions, and I particularly liked the aims and mission of We Are Here Venice. We were invited by the organisers of We Are Here Venice to actively engage with their projects and visit and work in their exciting studio, which was a really enriching experience. The social element of the fellowship was another important aspect of this trip. Our group of twelve Fellows was very diverse, which made us stand out from other national pavilions of the Biennale. We all became friends very quickly and made really good friends with the workers of other pavilions. 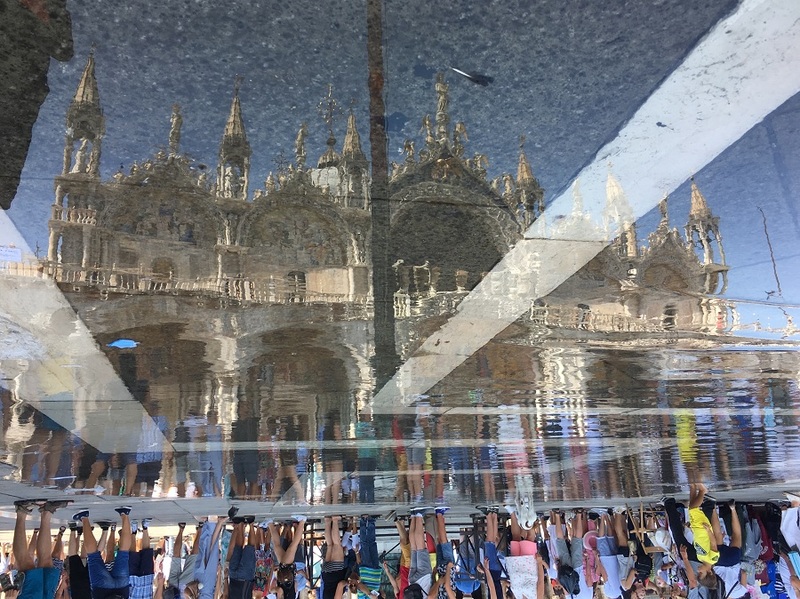 Every now and again someone posts a picture of our time in Venice on our group chat, which is normally followed by the recalling of beautiful memories and lots of heart emojis. Being around so many creative and inspiring people made me want to engage with my research creatively. I had never been to Venice before so I did not know what to expect. Once I was there, I was amazed by the functioning of the city: the environmental challenges that the city faces, the use of boats as public transport, the overwhelming amount of tourists visiting the city, the particular geography of Venice… all these elements were immediate indicators of the uniqueness of Venice. From this, I started to think about the need to contextualise Venice according to the socio-political frame within which it operates, a subject which is not normally included in the many guidebooks which the thousands of daily visitors to Venice carry around. I felt the need to address this lack of socio-political contextualisation, to bridge Venice with Italy and with the rest of the world, perhaps in an effort to demystify the romanticism of the city. This meant that the themes of globalisation, capitalism and immigration also needed to be explored. Halfway through my stay in Venice, I met with two representatives of the European Cultural Academy. Their advice helped me to focus my research on the topics of politics, culture and society. I presented some of my findings to the British Council in my ‘AlieNation Playbook’. This was a conceptual book which I created by interacting with a standard guidebook of Venice and ‘subverting’ it. Through collage, I expressed my personal feelings in relation to the geopolitics of Venice, with a strong focus on the many issues faced by Venice and society at large. I really enjoyed the whole experience and I wish I could express how much it meant to me, but it is very hard to express my gratitude with words. All I can say, finally, is that I really do hope that this fellowship programme continues for as long as the Venice Biennale exists. All the experience that I gained from working at a world-class art event, all the friends that I made, and everything that I learned with my research project made this experience a turning point in my professional, academic and personal life. I feel very grateful for having been given this opportunity and I do hope that many more students will be able to benefit from the Venice Fellowships in the future! I would like to say a huge thank you to Birkbeck and the British Council for an unforgettable experience.